During the New Network Theory Conference organized by the University of Amsterdam and the Hogeschool van Amsterdam in late June 2007, the question of just what was meant by the term ‘network’ came up several times, and with good reason. After all, virtually all social relations are network relations. What was meant in this case were technologically facilitated and media networks, which have undergone a boom as electronic agorae as a result of the explosive growth of the internet. While the evolution of the internet is subject to the influences of countless strategic interests, the ‘network of networks’ is still associated with a certain level of disorder and lack of control. 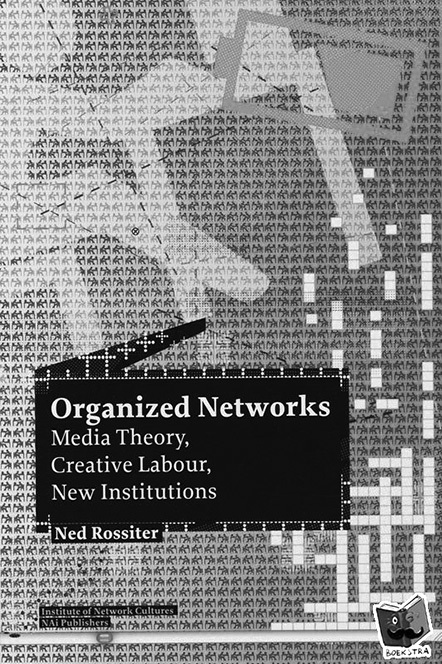 Thus the need to define and delineate the term ‘network’ becomes all the more urgent when an entire book is devoted to ‘organized networks’. This raises many questions, for did ‘we’ (as average internet users) not wish not to have to deal with all these strategic interests? Was not the very potential of the internet that it could bring together large groups of people with shared interests, without having to organize them beforehand? Was not the charm of the internet in fact the ‘unorganized network’? These questions have not escaped the notice of Ned Rossiter, who teaches media studies at the University of Ulster and is a research fellow at the Centre for Cultural Research at the University of Western Sydney. They are the premise of his extensive research. He wonders how these ‘unorganized networks’ maintain themselves. Who actually undertakes the necessary work, and under what conditions? Are there institutional structures that support the new internet-related networks? If so, which ones and, more importantly, why? Are new institutional connections and new forms of social organization being created? Are new forms not urgently needed? For some time, an information or network economy has reigned alongside the elusive, spontaneous and bottom-up organized networks, partly a product of the service economy (which is based, after all, largely on processing information and which far outpaces, in terms of size, the primary production sectors in every advanced industrial country) and partly of the creative industry. The digitization of the design process and the importance of design in virtually all applications of information have made the creative industry the spearhead of today’s economic development. It is a young, dynamic sector in which the informal relations (the quasi-‘unorganized’ relations) of the internet are elevated to the level of an all-encompassing operational culture. Rossiter is not the first to pose the question of what this means in concrete terms for labour relations within the creative industry. Andrew Ross, for instance, wrote a fine book entitled No Collar on relations within the ‘informal workplace’, and the Italian sociologist Maurizio Lazzarato dubbed the new forms of labour in the information society lavoro immateriale (immaterial labour). From very divergent backgrounds, Ross, Lazzarato and Rossiter take uncommonly sceptical and critical positions towards these new ‘immaterial’ labour relations and the disappearance of traditional labour relations, along with the guarantees and the protection of rights and responsibilities that the old workplace entailed. Rossiter points out that the primary function of a creative-industry worker is to create intellectual property (ip). This involves the direct commercial turnover of marketable ideas and their forms (image, sound, design, experiences), which is fundamentally different from the reputation-based economics of the traditional art world, in which incomes are generated indirectly by building up a reputation that leads to higher valuation for works and services. The privatization of cultural production, with its obsessive control over and protection of intellectual property (witness the hysterical discussions in the music industry), is the most significant hallmark of the creative industry. It represents a serious threat to the cultural public domain. In Rossiter’s view, something similar is taking place in the social and political public domain. Representative democracy seems to be transforming definitively into what he calls, in a paraphrase, a ‘shareholder democracy’. Are we becoming, instead of citizens in a civil democracy, shareholders in a fully privatized society? A society in which we, as ‘investors’ in this society, receive a return on investment (roi) of maximum efficiency from our collective institutions, under penalty of dismissal for executive boards in the case of policy failures, hostile mergers, takeovers, or divestitures – led by activist ‘shareholders’. In Rossiter’s book, the ‘state’ seems to have turned into an anachronism: a few condescending words are occasionally expended on this mastodon, but mostly to emphasize how hopelessly obsolete and completely irrelevant the institution has become. The growing supranational social structure, in which corporations and conglomerates as well as ngos and citizens’ movements operate at an international level, has led to entirely new economic and sociopolitical power relations. This raises the question of whether there are new institutional structures capable of taking over the role of old social institutions (the state, trade unions) under these altered conditions. New embodiments of such institutions are crucial if society is to be kept from turning into a fully liberalized jungle in which the only law is that of the fittest. Rossiter sees prototypes emerging in various places, such as the World Summit on the Information Society. This virtually global initiative by ngo-type organizations experiments in exemplary fashion with new forms of management and policy for the information society. To Rossiter, it is the initiative’s process-based character that is particularly remarkable. He identifies in it the outlines of a new type of ‘processual democracy’ that is no longer based on the principle of representation but is, instead, the product of constant interaction among diverse interest groups and social actors in a real-time networked context. These new forms of process regulation give rise to new organized networks that are more structured and more durable than the informal networks of the internet’s early phase of development. They form the backbone of the new supranational civil movements that are gradually taking over the role of traditional social institutions, focusing on working conditions, education, healthcare, the environment, minority rights and so forth. It is a good thing that – in the face of the reigning euphoria about the internet as a free space, the cultivation of the creative industry, the informal (no-collar) workplace, the hysteria surrounding user-generated content and Web 2.0 – Rossiter is raising serious questions about accountability, political operating space and issues such as labour relations, authority, income and the need for new institutional forms in the network society. In placing such a major emphasis on the political dimensions of these developments and on their material and labour-related conditions, however, he ignores the highly non-utilitarian and sometimes apparently nihilist character of 90 per cent or more of internet traffic and use. It is as though the ostensibly aimless experience of the great overwhelming majority of internet users and their cultures of use are of no interest to Rossiter. In a kind of neo-Gramscian move, they are relegated to the sidelines as by-products of subordinate importance and, at best, an illusory deception of the de facto oppressed masses. If this is genuinely the underlying, implicit assumption on which Rossiter based his book (he is not clear about this), he has grossly underestimated the ‘sovereign’ network subject.